Book 2 in the Legion Saga. A friendless mage-assassin is tasked by a desperate young king to save the nation by creating a secretive strike force in the face of overwhelming odds. They say, "A good deed rarely goes unpunished." Legion, the man of many faces knew that nothing was ever simple, especially when the conflict was far advanced, and the end game all but lost. It was well known in all quarters that the nation of Chios was outmaneuvered, its forces beaten and now licking their wounds behind walls of stone. Against all odds, the assassin Legion had delivered Chios once already, by inventing the inescapable doom known only as the Black Hand. And now this - an even more impossible mission - was his just reward. Yet in the end, what could one blade do against invaders drawn up on every side? However, long before he could do that, Legion would have to win over his colleagues. The sisters clearly despised him, the old Colonel certainly doubted him, while Durban, the court wizard, considered him to be a cancer within. So much for first impressions. Last time, Chios needed something greater than a hero. Now they needed something that Legion knew he could never become – the hope of a nation. Intricately plotted, action-packed, mysterious main character! Couldn’t put it down! 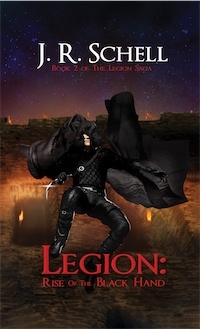 J. R. Schell continues the shadowy adventure of the assassin Legion in this second book. He adds a twist of court intrigue while maintaining an assortment of interesting characters, quality writing and action-packed adventure. The dragon scene is awesome! 5 Stars! Another action-packed adventure from author J. R. Schell. Legion: Rise Of The Black Hand expands on all that came before and reveals more of the complex history & motivations of the man of many faces, known only as Legion. Hidden in darkness, a mysterious visitor offers to save a desperate young king from the invaders on his doorstep. After a decade following his dreams and searching the world for stories to tell, J. R. Schell resettled in the formerly mundane land of Pennsylvania and finally got around to writing them down. A likely survivor of parenting, great themes flowing from great literature are an enduring passion.